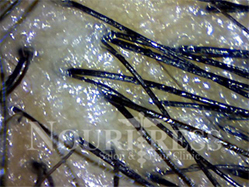 What is Microscopic Hair Loss Analysis? The cause of hair problems usually lies at the root of the hair in and around the bulb. where the root grows and reproduces. Our analysis performs a microscopiscalpscan5c investigation of top potential or current problems with your hair’s health. Our Microscopic Analysis allows us to see the reproducing matrix of hair cells. A close analysis allows us to identify common root problems, such as dirt and styling product build-up, bacteria and fungus, DHT enzyme symptoms, sebum build-up, and lack of hair nutrition. Our analysis works for men and women. Having the analysis performed is simple and convenient. Many hair problems can be managed with specified treatments and products designed to cleanse and treat. Have your Analysis Today! Results include targeted recommendations and products. Studies show that over 30 million women in the country are experiencing hair loss, with 70% of that 30 million being African American Women. You may wonder what is going on, why is this happening. This quick reference guide will give you an insight into what is really happening but to understand this epidemic you must understand the theory behind hair! It is normal to lose between 50-100 hairs a day, this is part of the hair renewal process. However, most people suffer from excessive hair loss at one time in their life. There are many reasons for this including medication, radiation, chemotherapy, exposure to chemicals, hormonal and nutritional factors, thyroid disease, generalized or local skin disease, and stress. Many of these causes are temporary and a few are permanent. Many dermatologists are recommending that their patients take hair vitamins but not just any hair vitamin. NouriTress Perfect Hair Vitamins PLUS is different than other vitamins on the market because it contains the natural herb Saw Palmetto which prevents the conversion of testosterone to DHT, and inhibits DHT’s binding to cellular receptor sites, increasing the breakdown and excretion of DHT. Once DHT levels decrease and the hair growth cycle is altered, the follicles can begin to return to normal levels of hair growth again. This is the most common cause of thinning and affects both men and women. Men generally have hair loss concentrated in a specific pattern from the front through to the crown. Women tend to have thinning throughout their head without being in any specific pattern. This type of hair loss is caused by the androgen DHT, or Dihydrotestosterone. After pregnancy many women experience a loss of hair, this is caused many hair simultaneously entering the resting (telogen) phase. Within two to three months after giving birth, some women will notice large amounts of hair coming out in their brushes and combs. This can last one to six months, but resolves completely in most cases. This condition is caused by the hormonal changes that take place after a woman’s body recovers from her pregnancy. Women who have a genetic predisposition to suffer from Androgenic Alopecia can have it occur at a much younger age by taking birth control pills. The hormonal changes that occur trigger the onset of the Androgenic Alopecia. If a woman has a history of female pattern loss in her family she should advise her doctor before going on the pill. After the discontinuation of the pill the woman may notice that her hair begins shedding two or three months later. This may continue for six months when it usually stops. In some cases the process cannot be reversed and the woman may not regrow some of the hair that was lost. Since the follicle is a very sensitive it does respond to imbalances in the body. Most hair loss causes by disease or illness is temporary and resolves itself after the body has returned to a healthy condition. Sometimes one to three months after a high fever, severe infection or flu, a person may experience hair loss, this is usually temporary and corrects itself. Both an overactive thyroid and an underactive thyroid can cause hair loss. Thyroid disease can be diagnosed by your physician with laboratory tests. Hair loss associated with thyroid disease can be reversed with proper treatment. Some people who go on low protein diets, or have severely abnormal eating habits, may develop protein malnutrition. To help save protein the body shifts growing hair into the resting phase. If this happens massive amounts of hair shedding can occur two to three months later. A sign of this is if the hair can be pulled out by the roots fairly easily. This condition can be reversed and prevented by eating the proper amount of protein. Its very important when dieting to maintain an adequate protein intake. Some prescription drugs may cause temporary hair shedding in a small percentage of people. Examples of such drugs include some of the medicines used for the following: gout, arthritis, depression, heart problems, high blood pressure, or blood thinner. High doses of vitamin A may also cause hair shedding. Chemotherapy and radiation treatment will cause hair loss because it stops hair cells from dividing. Hairs become thin and break off as they exit the scalp. This occurs one to three weeks after the treatment. Patients can lose up to 90 percent of their scalp hair. The hair will regrow after treatment ends and patients may want to get wigs before treatment. There are some drugs in development to help prevent this hair loss from occurring. Iron deficiency occasionally produces hair loss. Some people don’t have enough iron in their diets or may not fully absorb iron in their diets. Women who have heavy menstrual periods may develop iron deficiency. Low iron can be detected by aboratory tests and can be corrected by taking iron pills. Drugs in this class work by inhibiting the enzyme 5 alpha reductase, which limits the conversion of testosterone to DHT (Chen et al., 1996) Finasteride (propecia) is the first drug in this class to undergo extensive clinical trials in men. Finasteride has selective activity against 5 alpha reductase. As a result, serum and follicular DHT levels are significantly reduced (Dallob et al., 1994). Studies have shown that saw palmetto is an effective anti-androgen. It acts in a similar way that propecia does. Firstly it lowers levels of DHT in the body by blocking 5 alpa-reductase. Secondly Saw Palmetto blocks receptors sites on cell membranes required for cells to absorb DHT. Although no studies have been carried out on saw palmetto and its relation to hair growth, studies have been performed on the use of Saw Palmetto in the treatment of benign prostatic disease, which is similar to androgenetic alopecia in that it also depends on the production of dihydrotestosterone. All of the studies that have been performed to date show that Saw Palmetto is an effective anti-androgen and has shown conclusively to be effective in the treatment of benign prostatic disease. One may assume from this that since Saw Palmetto is an effective anti-androgen and is used in the treatment of prostatic disease then it may also be effective in the treatment of androgenetic alopecia. Some vitamins have been show to inhibit the activity of 5 alpha reductase and subsequent production of DHT. These vitamins therefore may be of great benefit in the treatment of androgenetic alopecia or preventing baldness. There has been studies in which zinc is shown to inhibit 5 alpha reductase activity and it has therefore been concluded that zinc is beneficial in disease and disorders related to an excess in DHT. There has also been studies which have show that vitamin B6, Zinc and azelaic combined together even in low concentrations resulted in a 90% inhibition of 5 alpha reductase activity. Propecia has been tested and found to be effective in the treatment of AGA. However, its list of possible side effects include sexual adverse experiences. It also affects PSA levels, which is the screening indicator for prostrate cancer. Propecia must be prescribed by a dermatologist or doctor. Saw Palmetto has been proven safe to use. It has no known drug interactions and is well tolerated by most people. The only noted side effect in a very small percent of people is upset stomach. Saw Palmetto can be taken with zinc, vitamin b6, and azelaic acid for a synergistic effect. Normal healthy hair grows about 1/2 inch per month. It may take several months before any effects are noticed. Where the area is completely bald, hair may not grow, if the follicles are dead. It takes years for the hair to thin, so one must assume that it will take time to also reverse the process. Keeping the hair from further thinning is success in itself. Call and schedule your Scalp Analysis today!